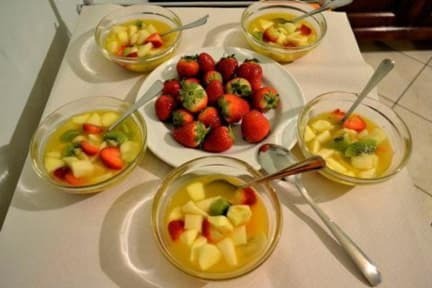 Al Galileo Siciliano B&B i Palermo, Italia: Bestill nå! La cancellazione della prenotazione va effettuata entro le 72 ore antecedenti alla data di arrivo pena il pagamento del 50% del totale del soggiorno prenotato. 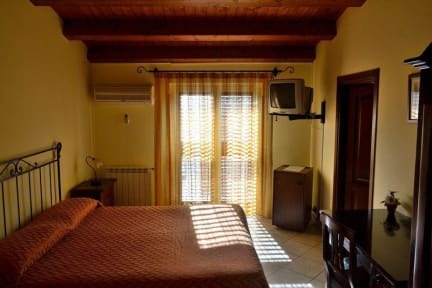 Located in a building of 800 completely renovated site in the center of the city, the B&B offers you a comfortable stay to discover Palermo. The location of the B&B Al Galileo Siciliano it allows you to reach on foot the main monuments of the historic center like the Cathedral, the Royal Palace and the Quattro Canti, Teatro Massimo, the Abatellis Palace, the Chiaromonte-Steri Palace and historical markets as Ballarò Vucciria and Capo. On the ground floor there are two great halls furnished as well as the rooms style where every morning guests have their rich breakfast. Other service: on demand there's a *guarded parking, *room-service, *bike renting, *agreements with car rental, and free internet point. The service includes daily cleaning and tidying of the room and the bathroom as well as a rich breakfast buffet. The change of towels is every other days (paid for every day).